The folks at Downum’s Waste Services in Northeast Arkansas know that what they do is tough and dirty work. Yet, they also know if the job is done correctly no one should have to get their hands dirty, unless the wheels crush and fail on their biggest and heaviest waste containers during solid waste disposal. That is exactly what was starting to happen when they came to Colson Caster for a solution. Colson Caster Corporation, the world’s leading manufacturer of standard and custom application caster and wheel products has a headquarters location about 20 miles from Downum’s offices in Hoxie, Arkansas. Colson sales engineers met with the team at Downum’s and discovered that there were two sets of problems. The first, some of the wheel hubs on the company’s waste container casters were of a standard cast iron design with roller bearings. Not an unusual choice for the operation– acceptable pricing and published specs but, as it turned out, not the best solution for the long-term rigors of the company’s trash moving applications. 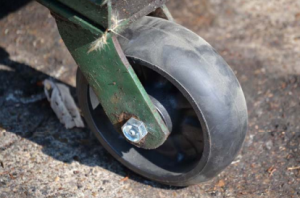 The casters had started to lock up on waste containers causing tread damage with each successive use and leading to eventual movement failure. Each episode of breakdown was responsible for time lost with maintenance crews, lost revenues on containers out of commission, and expensive replacement procedures and repair of damaged containers. The engineers at Colson soon determined that the caster lock up was caused by the complete detachment of the caster wheel’s iron hub from its rubber tread. It seemed that the detachment was the result of tough environmental conditions that lead to the iron hub spokes popping from the wheel and 2 then breaking out, freezing the bearings and initiating the ensuing tread wear and ultimate wheel failure. Colson knew that they needed an affordable replacement for all of the company’s heavy-duty waste containers and one that eliminated the cast iron core with the spokes to stop the breakage and blow out. They had also determined that the new wheels would need to withstand harsh environments, as weather and waste, not just weight, helped wear on the roller bearings causing rust, lock up, and the resulting tread damage. In addition to the issues with the cast-iron wheels, Downum’s was also using phenolic wheels on some of its containers. Colson engineers soon discovered what Downum’s employees already knew – the phenolic roller bearings were routinely freezing up due to environmental conditions, which resulted in flat spotting and the inevitable impairment of mobility for the container. 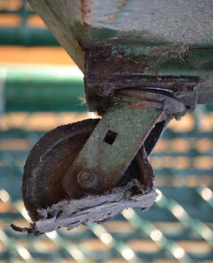 Neither the customer nor Downum’s employees could move the handicapped containers and a truck and cable were needed, resulting in even more damage to the wheel and lost time at Downum’s, not to mention the customer’s dissatisfaction. This problem was also added to the work list for the Colson crew. Fortunately, Colson had just launched a brand new wheel product, the Trans-forma™ LT, which seemed like a viable solution to both of the waste company’s problems. 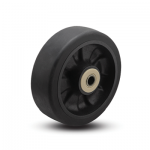 This new wheel, designed for smooth and easy rides in particularly hearty and rough service and weather environments, was constructed with a thermoplastic elastomer (TPE) tread. The TPE material was engineered especially to resist water damage associated with wet and punishing applications. In addition, the caster was made without a spoke design and with Delrin bearings which needed no lubrication to provide hold up in rain, sleet, snow and everyday moisture, not to mention the goo, muck, and mire associated with the trash and waste collection business. Still not taking the new Trans-forma LT wheel for granted, and as with all Colson wheel and caster products, construction and design elements of the new wheel were tested in Colson’s own labs to ensure the performance and durability under the heavy and demanding 3 loads that Downum’s would require over long periods of time and their endurance of all types of weather and environmental potentials. The tests were successful, and both companies’ engineers selected the Colson 4 Series standard swivel fork with 6” Trans-Forma LT wheel with the Delrin bearing to replace all existing wheels as the solution for the waste company’s tough, demanding, and multi-environmental needs. Not only did the wheels live up to everyone’s expectations but it seemed there were a couple of extra bonuses with regard to affordability and ‘waste’. First, the new wheels are made in the USA, giving shorter lead times and extremely reliable delivery, with all recycled materials. Also, not only are the Trans-Forma LT a less expensive solution outright, but because of the lighter weight than the iron-hubbed caster wheels the company no longer wastes money on more expensive shipping costs! In addition, the LT wheels are completely recyclable and were added to Downum’s own recycling collection bins. And finally, the Trans-Forma LT wheels are made with Colson’s co-injection molding which further reduces manufacturing costs overall. Simply the perfect solution to ‘clean-up’ all of Downum’s wheel problems! To talk with any of the engineers involved in this study or to find out more about this application, please contact Colson Caster at 800-643-5515 or Downum’s Waste Services at 870-866-5434. 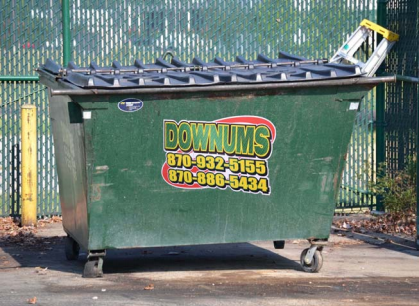 Downum’s Waste Services, Inc. is a family-owned business since 1975. The company has a wide range of solid waste disposal services. The company also has a Transfer Station that allows for public dumping. For more information, visit www.downumswaste.com. 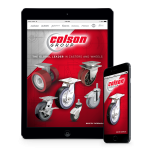 For more than a century, Colson Caster Corporation has been providing the world with the highest quality and largest selection of premier caster and wheel products. Headquartered in Jonesboro, Arkansas for the last 50 years, and with more than 150,000 square feet of state-of-the-art 4 manufacturing space, Colson designs and produces the industry’s largest selection of casters and wheel products, caster options, and accessories. The company is the leader in caster innovation and builds exclusive caster products for all of the world’s markets. For more information, visit www.colsoncaster.com.